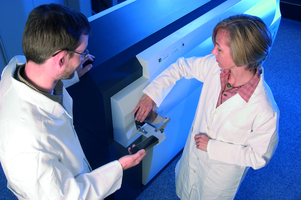 Whether it is for analysing medical protein samples, including cancer cells, for example, or for polymer analyses or identifying and classifying microorganisms quickly and reliably, Phytron's VSS in-vacuum stepper motors are the perfect choice for our customers for positioning the sample grid in a mass spectrometer precisely under the ion source in the X, Y, and Z direction. However, the analyses described above can only be carried out with the exclusion of air, generally at a high vacuum of approx. 10-6 mbar. 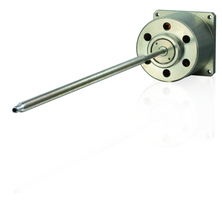 In a vacuum, the components used, such as stepper motors, spindles or encoders, have to meet particular requirements. Like any other electric motor, a stepper motor produces heat through the ohmic losses in the motor winding during operation. In a vacuum, this heat cannot be removed into the environment via convection, as can be done at atmospheric pressure. The material used must therefore be particularly temperature-resistant. At the same time, it must not outgas as a result of the higher temperatures and effects of the vacuum, as this could quite possibly cause a contamination of the customer application. Phytron can draw on more than 30 years of expertise when it comes to the choice of suitable materials and the conditioning of in-vacuum stepper motors. By working closely with our customers, we have succeeded together in designing a highly precise, no-backlash drive system that stays relatively cool despite the vacuum and high motor speed and thus makes it possible to examine samples containing protein, which would coagulate at 42°C . Our customer is impressed with the VSS/VSH in-vacuum motor concept, as it is no more expensive than systems with rotary feedthroughs and standard motors. In fact, the overall action is greatly simplified by the in-vacuum motors and the system requires less maintenance, which not only keeps our customer satisfied, but also keeps our customer's customers happy. Various systems use both Phytron's VSS/VSH standard motors and also customised solutions with spindles and no-backlash pretensioned spindle nuts.